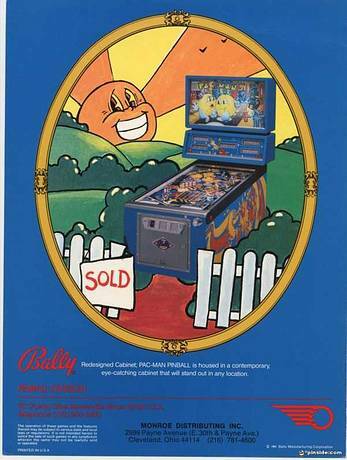 Mr. & Mrs. Pac-Man is a pinball machine from May 1982, manufactured by Bally Manufacturing Co. 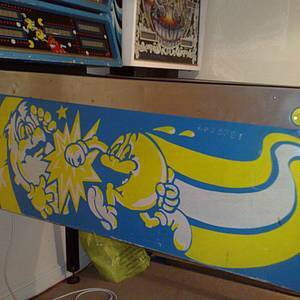 This pinball has 3 flippers, 11 drop targets, 6 standup targets, 2 pop bumpers, 2 sling shots, 2 saucers, and a 5x5 matrix of lights in the playfield called the Pac-Maze (Pac-Lite or Vid-Grid). It has a voice synthesizer with a rather large vocabulary for its time. 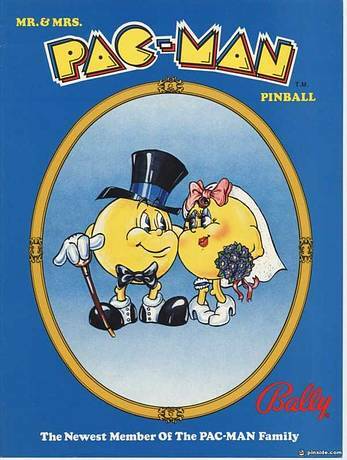 Mr. & Mrs. Pac-Man has a diverse sound package which integrates many of the arcade Pac-Man sounds. 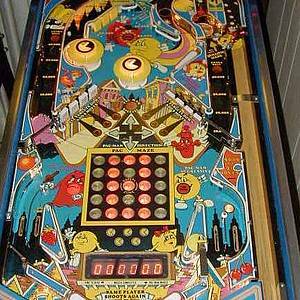 The main objective when playing Mr. & Mrs. Pac-Man pinball is to collect ‘moves’ then complete as many Pac-Mazes as you can. Progress in the current maze is scored at the end of each ball. 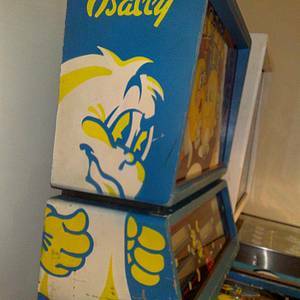 Completed mazes are scored again at the end of the game. 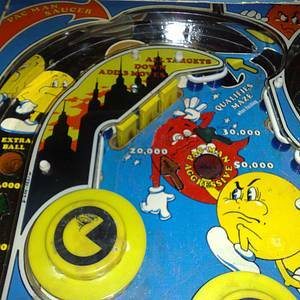 Mr. & Mrs. Pac-Man pinball has one of the hardest opening skill-shots. 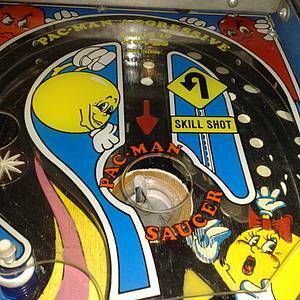 It requires just the right amount of plunger force to allow the ball to drop into the saucer. The reward is immediate entry into the Pac-Maze with 10 additional moves and Aggressive mode (where you can chase the red ghost instead of running from it). 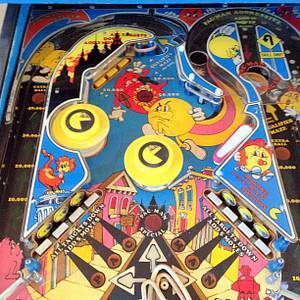 Entering the saucers will either progress toward an extra ball or enter the Pac-Maze if the minimum moves have been collected. 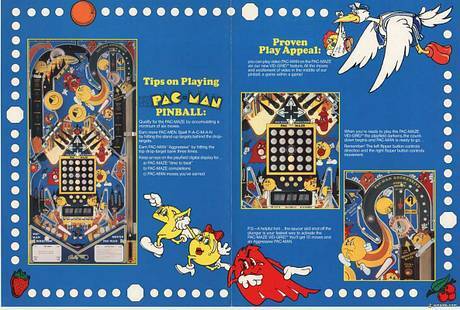 Each Pac-Maze must be completed in a set amount of time. Chasing too many ghosts in Aggressive move will use up your time quickly. 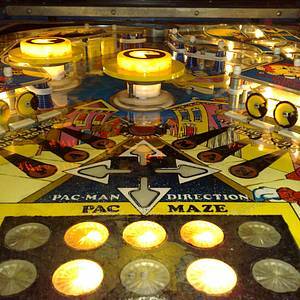 Once you run out of time, you may not re-enter the Pac-Maze until the next ball. 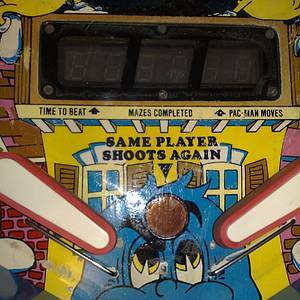 The 6-digit display in the playfield keeps track of your Pac-Maze progress. The right-most two digits let you know how many moves you have been awarded. 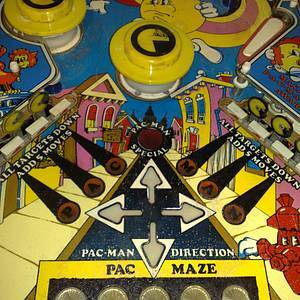 The middle two digits keeps track of the number of Pac-Mazes completed. The left-most displays tracks the number of seconds you have left to complete the current maze. 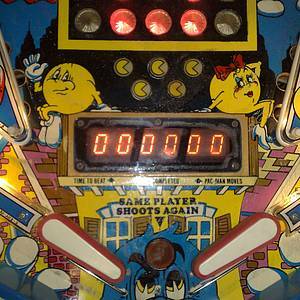 The five pacman lights below the 6-digit display indicate the number of 'lives' left for which the ghost (red light) in the maze can hit you when not in Aggressive mode. 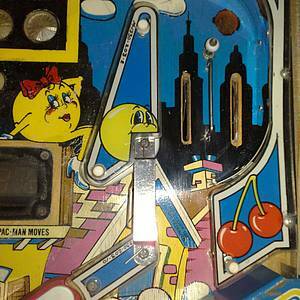 This game has received 43 approved Pinsider ratings and currently has a rating of 6.290 out of 10. 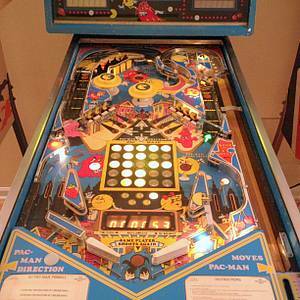 162 Pinsiders have this game in their collections. 55 Pinsiders have this game on their wishlist.